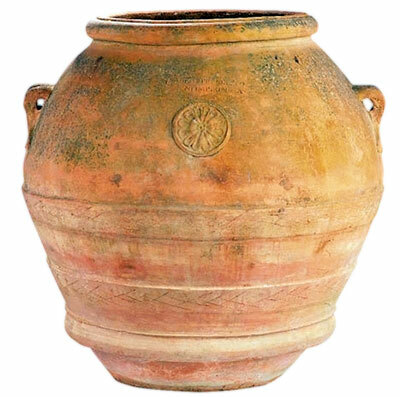 Anyone who knows me knows how much I LOVE terracotta pots. 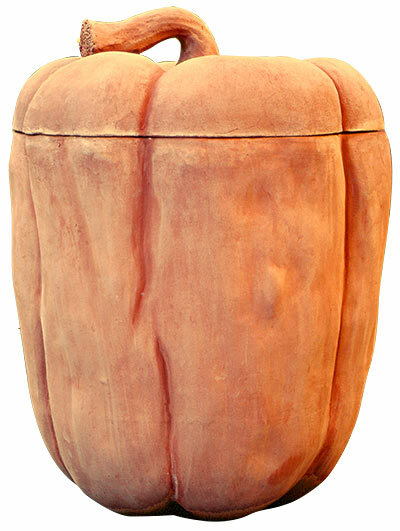 Here is a video showing the process by which these hand-made pots are created. 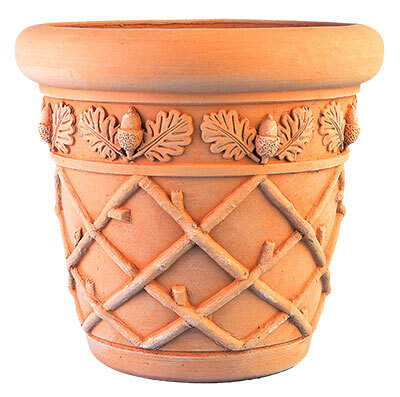 But this company also sells new terracotta pots, many of which have been designed by well-known garden designers in the United States. How can you not love this pot (above)?! It was one designed as part of the American series of pots for Siebert & Rice by the flamboyant garden designer Ryan Gainey (right). It pays homage to the traditional British basketweave pots, but instead uses a ‘faux-bois’ (fake, or imitation wood) motif instead. I *really* want this pot! And this one on the left is a quirky, intricate vase-shaped pot (known as a ‘long Tom’)designed by Abbie Zabar. 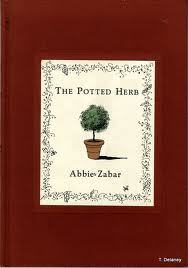 You may remember that she wrote and illustrated the little book called The Potted Herb. And Ken Druse (gardener, author and photographer extraordinaire) created this concept of a pepper pot (right) that can be used as either a quirky garden sculpture or with its top removed, an organic planter. He also hosts a regular pod-cast that can be listened to here. Or if a more classic design is your cup of tea, this acanthus decorated pot with a flared lip (left) is the perfect addition to any garden. The problem is that, as far as I know, there is no one in Canada retailing these beautiful pots. 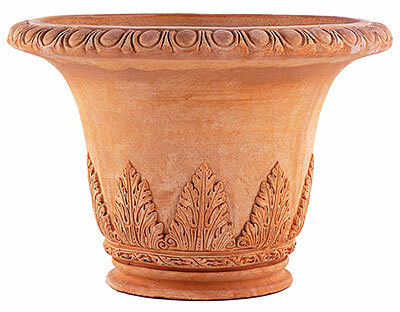 But, the good news is that Whichford Pottery, a well-known British terracotta maker, is available at some locations here in Canada (namely Southlands Nursery). Here is the range of shallow basket pots that they sell. Years ago when I was visiting a friend in Oxford we made our way to the Whichford Pottery and I went a bit overboard purchasing some of these pots. It didn’t matter how I packed them in my carry-on, they still weighed the same. But I was lucky enough to get them home anyway! In Mount Forest, Ontario, Paul Kaye and Elsa Mann are two potters making heirloom terracotta and salt-glazed pots under the name Night and Day Studio. 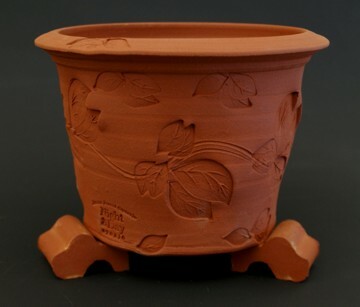 This is their most popular pot with a pressed leaf motif; it is shown with three pot feet, allowing the planter to drain properly when it’s watered ensuring the plants do not suffer rot. 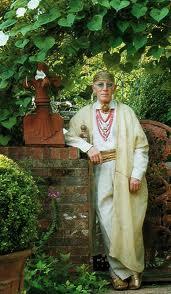 You can order these pots (as well as other decorative gems) from their website. 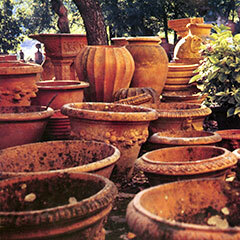 Years ago I bought an assortment of antique terracotta pots from Five O Seven Antiques in Toronto. Today I saw this (left) in their inventory. Isn’t it lovely? Not terracotta but certainly looks like carved stone. It’s probably cast stone though but very exquisitely rendered. I expect it’s VERY heavy! 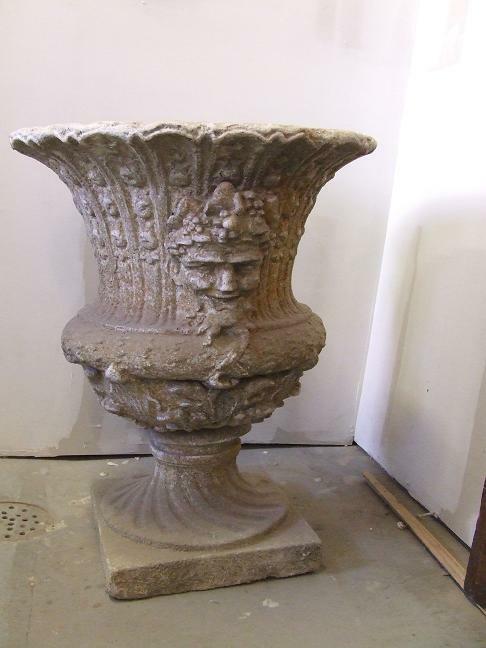 Found your website on a search for terra cotta pots in Vancouver…it’s great! I love Southlands Nursery too! I go there all the time, just living up the street. I used to live in Ottawa in 1989-1991….remember the tulips coming out in May at Dow Lake Park. You have a short growing season, what kinds of plants do you grow there successfully? Thanks Lisa! You are lucky to live so close to Southlands — I am envious :c) Well, this ‘spring’ the tulips might have to wait for June to bloom lol! There has been so much snow and frigid temps that it might take a while for the soil to warm up. Yes, we certainly have a shorter growing season than you, but we do seem to have warmed up since I first started gardening: where Ottawa was once considered Zone 4, it is now a solid 5 I think. We couldn’t grow things like Japanese maples, Japanese forest grass and other lovelies but now I plant them all the time :c) We’ll see how this winter’s cold temps have treated them. Do stop by again. I’ll feature some local (and not so local) gardens again this summer.